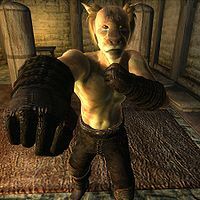 J'Ghasta is a Khajiit boxer who lives in Bruma. He is a speaker of the Black Hand. J'Ghasta will only appear in the game when you initiate the related Dark Brotherhood quest, Broken Vows, in which you are contracted to kill him. The contract claims a prominent Cyrodilic noble wants J'Ghasta dead for breaking his engagement to the noble's daughter. He wakes up early in the morning, at 5am, to have a long breakfast of three hours. Then he will train for a long twelve hours, hitting each of his training targets for four hours respectively. At 8pm he will finally give it a rest, retreating in his chair to read for four hours, after which he will go to bed. All of this takes place in the basement of his house, meaning he'll never leave it, unless he is pursuing you. J'Ghasta is garbed in leather armor except for his chest and head, which are bare. He will also carry a copy of Guide to Bruma, a small amount of gold, and his key. When you greet him, he will immediately warn you: "I don't recall inviting you into my house. Leave, quickly, or we will have a problem." After this, you have two possible replies. You can tell him you two already have a problem, which will anger him: "What? Who are you to come into my home, to speak to me like a petulant child? Do you know who I am? Do you have any idea what you're dealing with?" If you tell him that you've been invited by Sithis himself, he replies in a confused and insulted manner, which surprisingly clarifies his knowledge of Sithis and his Void: "Sithis? What is this treachery? Who sent you? I don't know who is behind this outrage, but I will have blood! To the Void with you, assassin! ", after which you can deduce him to be a member of the Dark Brotherhood as well. You can also choose to say nothing, leaving him to conclude you're a harmless thief caught in the act, when he will reply with a smile: "So, the thief opts for the stoic approach, hmm? Oh, my friend, I'm afraid you've broken into your last house. Ha ha ha ha ha!" All of these options cause him to attack you relying on his fists and his set of Monk Spells to do the job. Note that he has the unique Black Hand Ability, which gives him 50% Resist Magic and 50% Resist Normal Weapons. Broken Vows: Deep within the well of Skingrad Castle Courtyard, the next Drop matches killer against killer. Judging by the construction set, J'Ghasta may be a practitioner of the techniques of the Ancestor Moth Monks. Searching the secret training room in his Bruma house will yield a copy of the Dark Brotherhood text, The Brothers of Darkness, hinting towards his position within the Brotherhood. A Black Hand Robe, Black Hand Hood, and The Five Tenets can also be found in a locked keg in a corner of the lower level of his house. In the game, it is stated that J'Ghasta is a Speaker in the Dark Brotherhood and also belongs to the Black Hand. However, in the construction set, J'Ghasta is only listed as a member of the "Dark Brotherhood -- Won't Call Guards" faction (editor ID DarkBrotherhoodNoGuard). This faction does not have any ranks. The information listed in the summary box is the construction set faction, because this is the information that controls the NPC's disposition, dialogues, and responses to scripts; see Factions for details. J'Ghasta is the first person Mathieu Bellamont tricks you into killing. If you talk to J'Ghasta, before you attempt to assassinate him, you can tell him Sithis sent you. J'Ghasta's response will reveal his surprise at that, wondering if treachery has a play in it. This is one of the first hints that something is wrong with the Dark Brotherhood contracts. J'Ghasta's house is a very good target for a Thieves Guild member to rob during the first few missions as the house is close to Ongar the World-Weary and J'Ghasta only appears during this quest. Esta página foi modificada pela última vez à(s) 05h32min de 20 de outubro de 2015.